It's our mission to offer you an easy and safe way to find verified buyers, traders, exporters, wholesalers, manufacturers, importers and suppliers across the world. We believe that buyers and suppliers should always interact directly and that is why we put the suppliers on the forefront by redirecting customers to visit supplier website unlike other online B2B portals where buyers get to interact with the portal site only. SuppliersTree.com is a largest online B2B marketplace that provides reliable platform for manufacturers, suppliers & exporters to find valuable international buyers. Worldwide free online B2B business directory with listing of 5M products & Indian companies. Are you waiting for direct unshared genuine enquiries, quick responses or want to expand your online business for a long time? 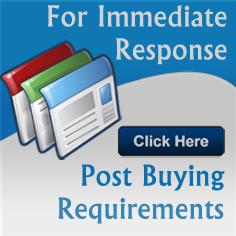 Post your selling offers & trade leads free to get direct enquiries & responses from verified buyers all over the world. Want only genuine, verified, relevant and unshared business buying enquiries? Get instant unlimited access to buyers and their requirements anytime and anywhere. You can use buyers contact information to build your customer database. SuppliersTree.com is not programmed on shared basis algorithm unlike other portals. Therefore, we do not promise to provide thousand shared enquiries per month. We guarantee not to share or disclose your business enquiries with other suppliers. Buyers can only browse and search products on supplierstree.com and get re-directed to your own website. 1. We are umbrella manufacture located Next to Hangzhou airport. Gel Pens - My USA based retail and distribution company is looking for the Best Supplier of high quality gel pens. We want to do a Test purchase asap. We have managed to come in the top search results whenever anyone across the world tries to search for the products we offer.